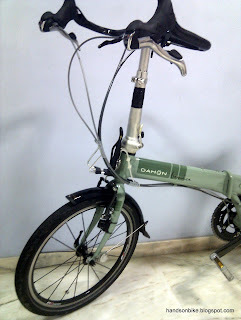 In today's blog post, I will show you how to do some serious upgrades to your Dahon! Sometimes, you just cannot find your ideal bike off the shelf. Which is why there are custom bike services, and the first that comes to my mind is a be-spoked Brompton. 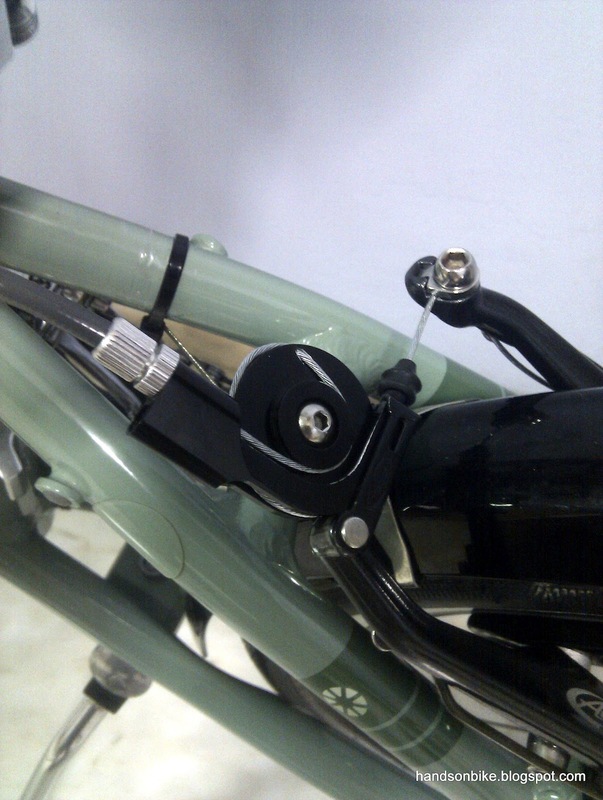 You get to choose exactly what accessories go onto your bike, what frame material, what colour and etc. It is good because you get everything you want and nothing you don't want. 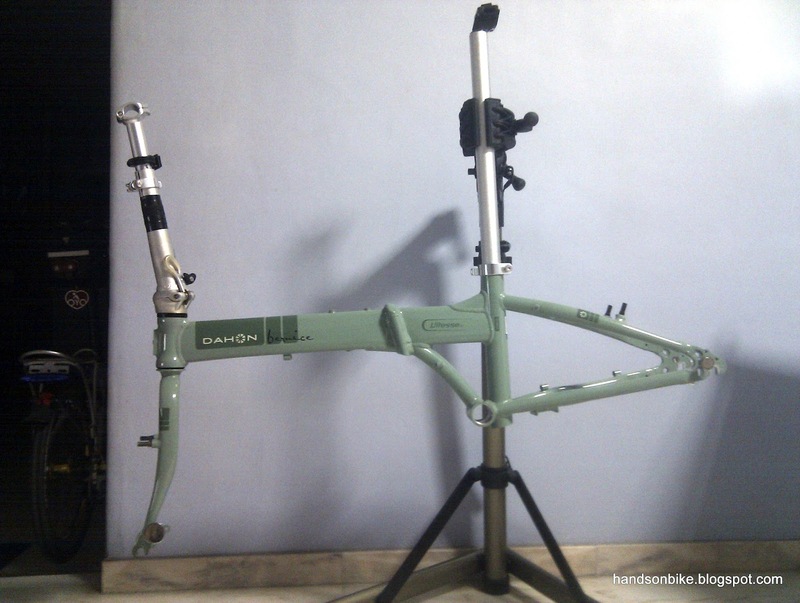 However, the component selection for a custom bike is usually pretty limited, you can't really choose exactly what components you want, unless you pay more or change it afterwards. Which is why people upgrade their bikes and change components, because they can choose exactly what they want. 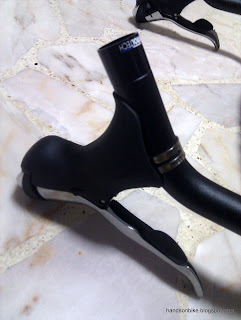 As previously discussed, bullhorn bars are known for their comfortable grip positions. 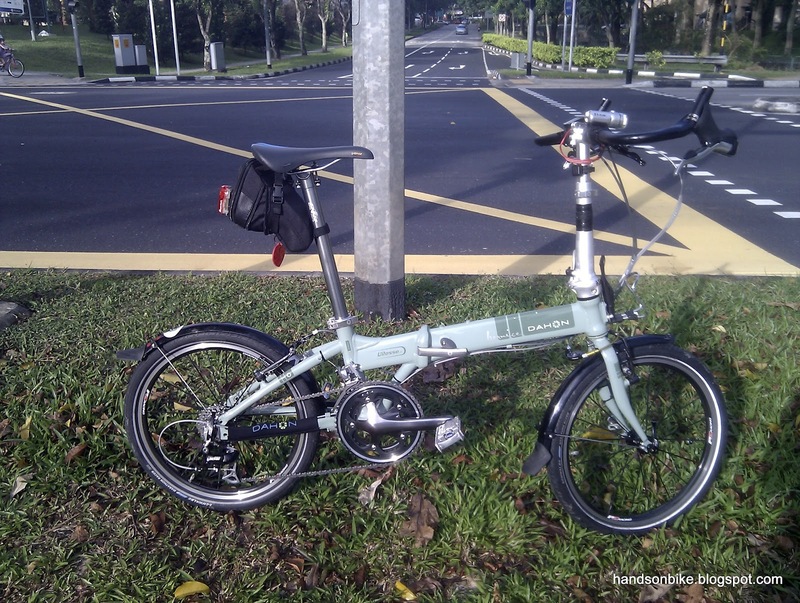 However, there are not many folding bikes out there with a bullhorn bar. How many can you think of? Other than the Dahon Speed Pro TT/ Vector X27 or the Tern Verge X30, the other one I can think of is the KHS F20-R. There are probably only a few others out there. 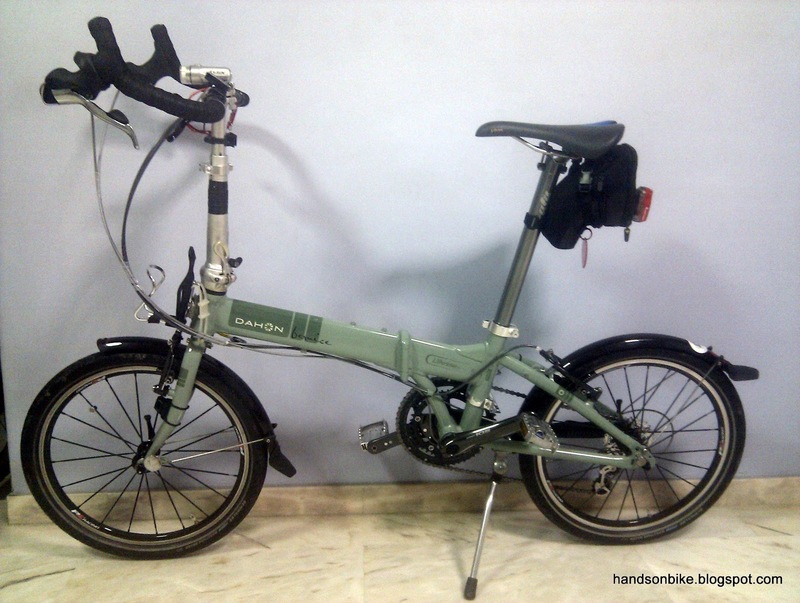 Today's highlight will be converting a Vitesse P9 to a Vitesse P18-TT! 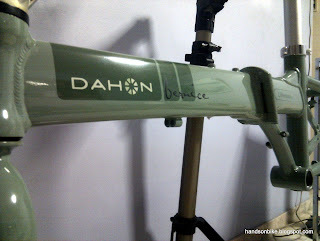 Bike frame after waxing with Hi Glaze 88. Clean and shiny! Same 9 speed 12-28T custom SRAM cassette. After cleaning it looks brand new! 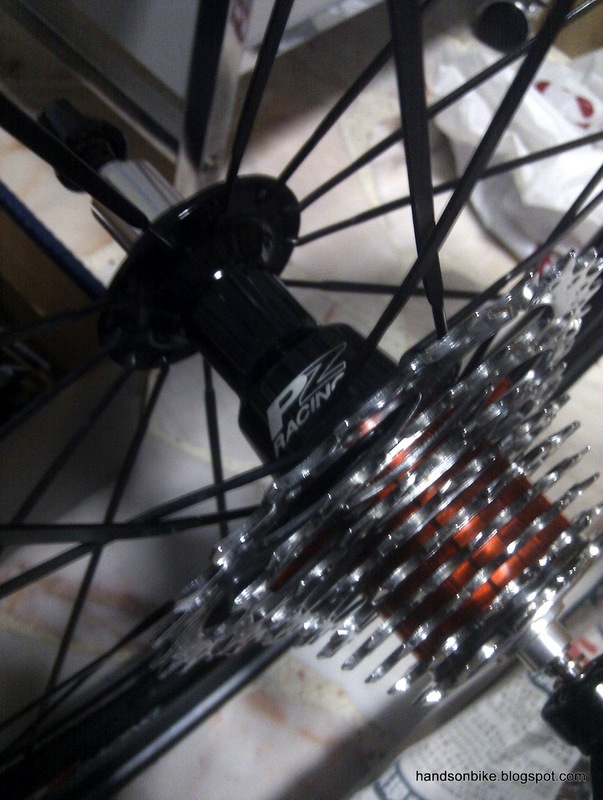 Installed on the excellent PZ Racing wheelset. 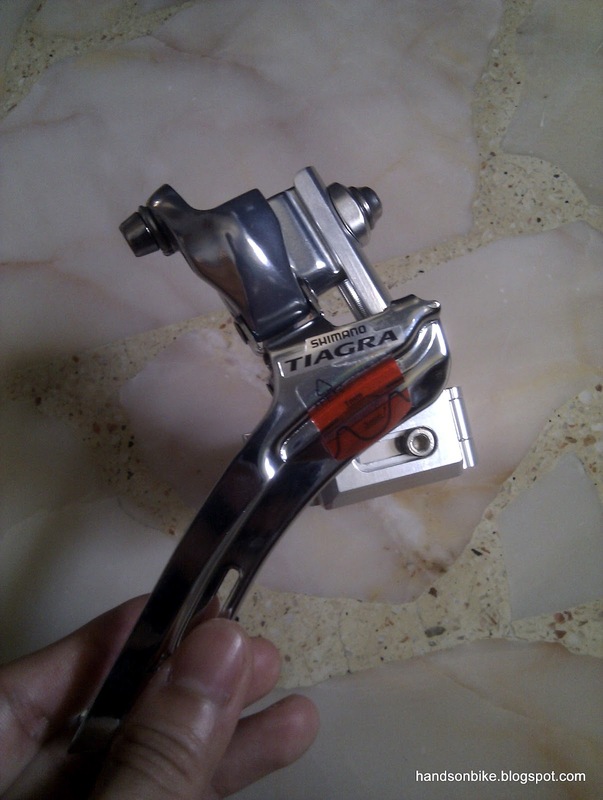 New rear derailleur! 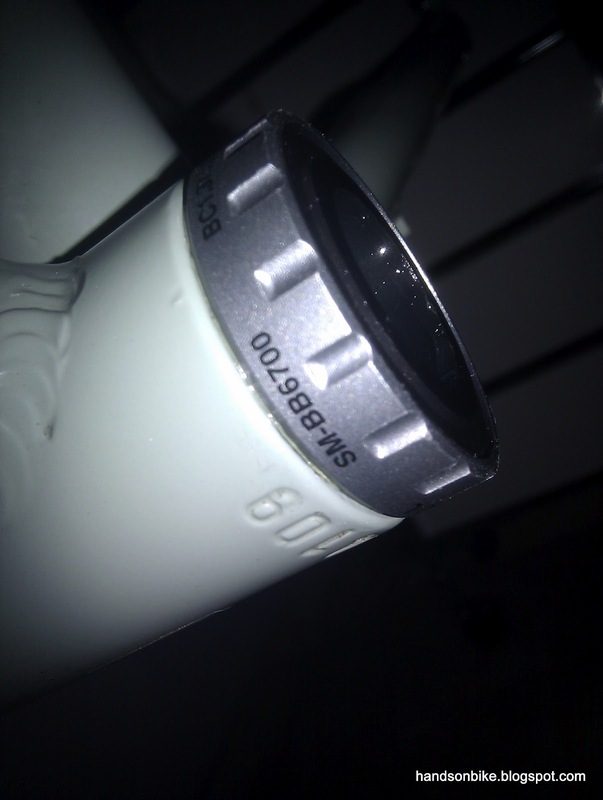 Shimano 105 5600 RD, which was previously on my Boardwalk. 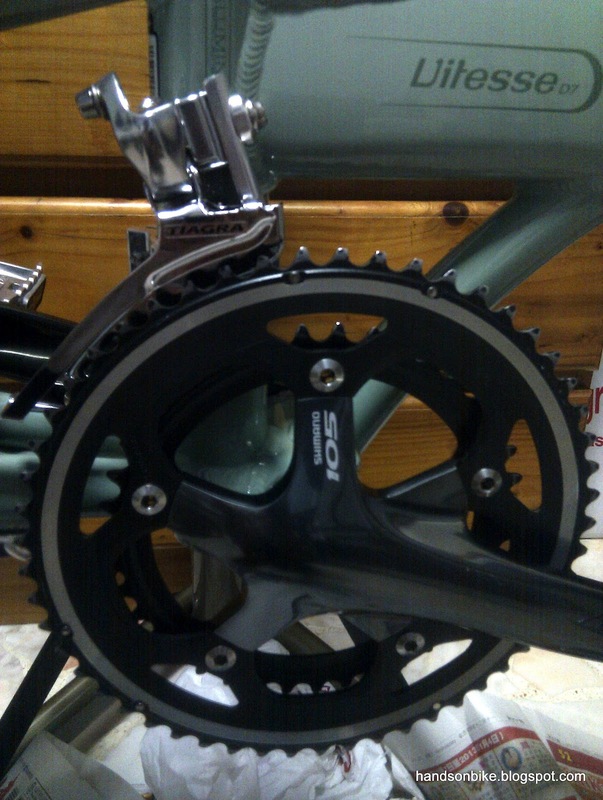 Shimano 105 5600 crankset, also from my Boardwalk. 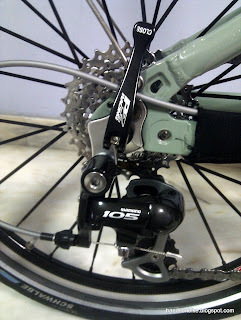 Major improvement from the stock D7 crankset! 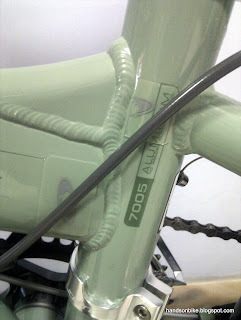 One major issue I encountered with the new drivetrain was that the chainline was not ideal. 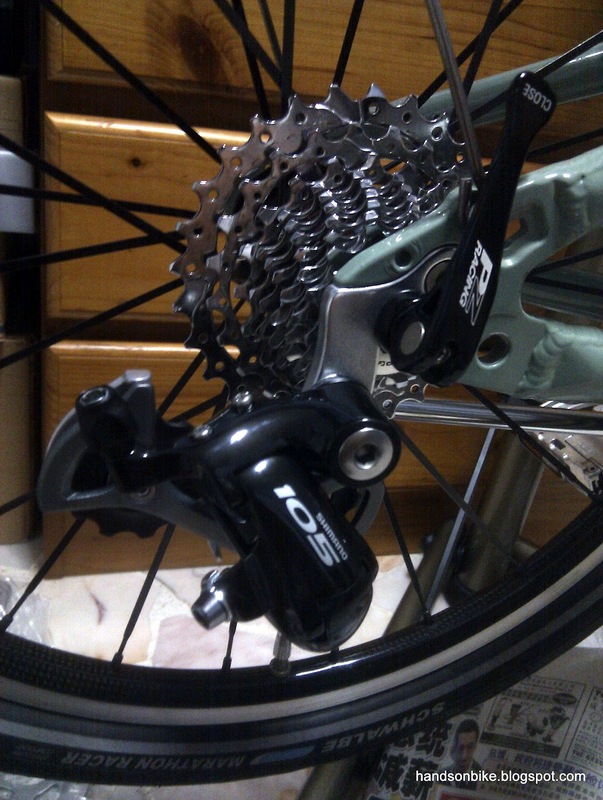 Also, I was using a 9 speed chain on the 10 speed crankset. Because of this, it meant that in the small chainring and small sprocket combination, the chain will rub on the inside of the large chainring, where the ramps and spikes will catch the chain and make it shift onto the large chainring. It was not just a little chain rubbing, it was more serious as it tends to cause the front gear to shift on its own. 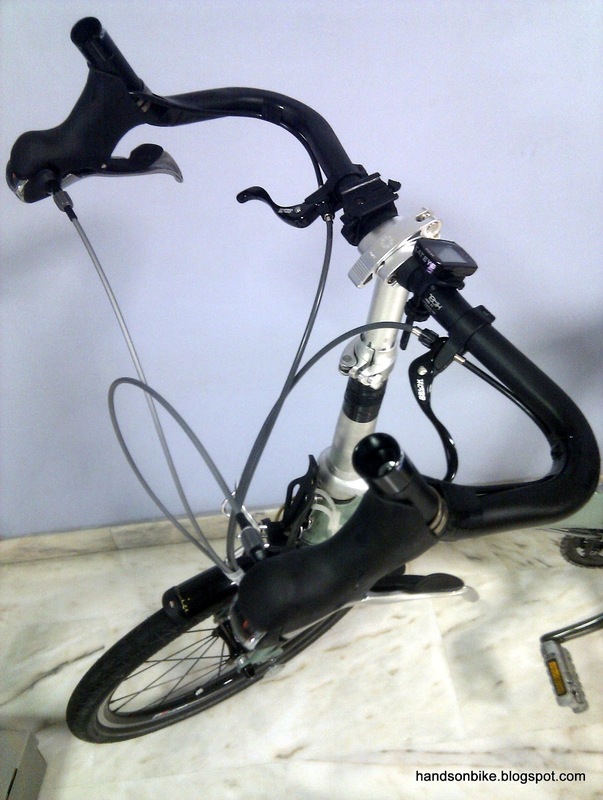 Although this cross-chain gear combination is not recommended, it will be prudent to make sure that even if this condition happens, it will not cause a big problem for the cyclist. 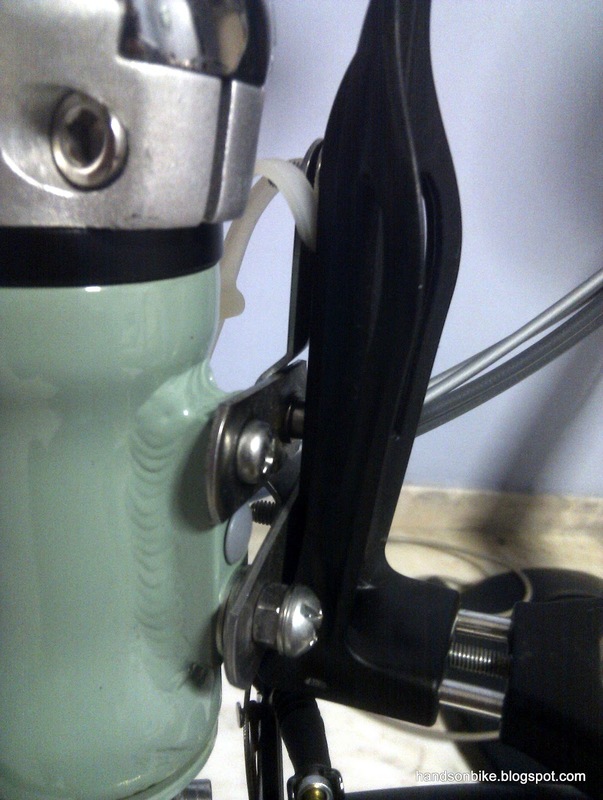 To solve this, I added some spacers under the right-hand BB cup, in order to move the crankset further out. 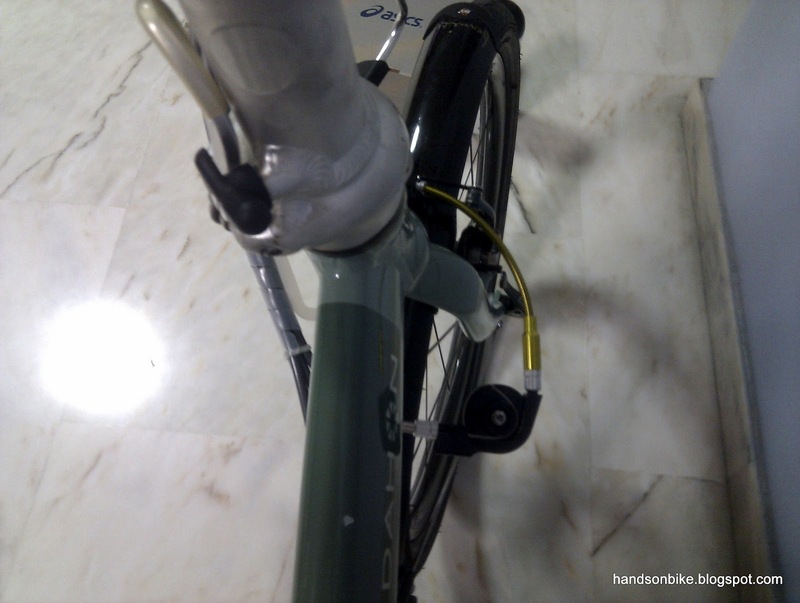 This is unusual as road cranksets usually do not need spacers. These spacers increased the chainline by about 1.5mm, which is the maximum that is possible. 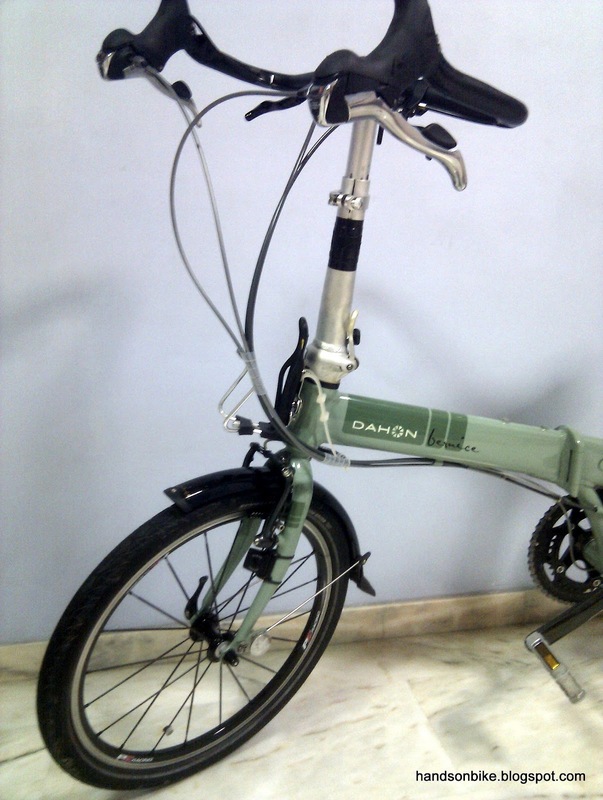 Any thicker and it will cause the axle protrusion on the left side to be too short to fasten on the left side crank. 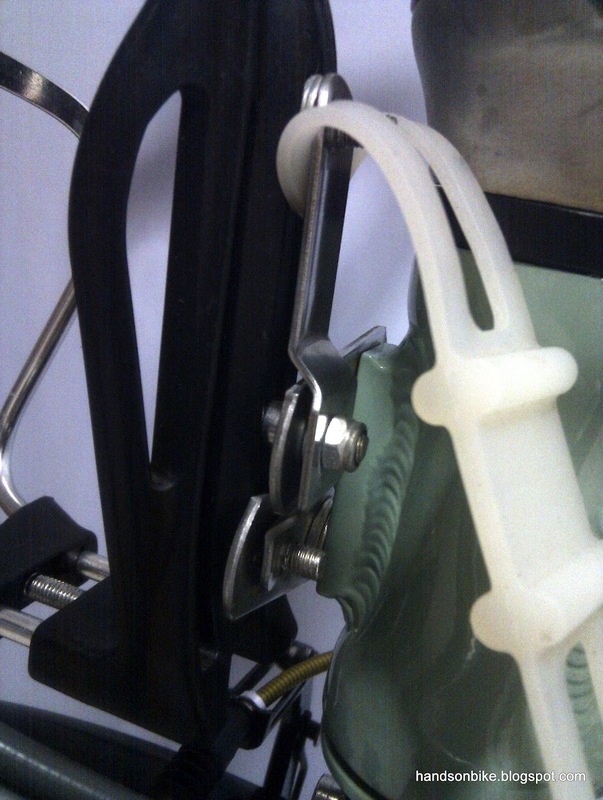 After doing this modification, the chain rubbing problem still cannot be completely solved, but at least it is not so bad. To avoid this problem, when the small chainring is being used, the 2 smallest sprockets at the rear must be avoided. 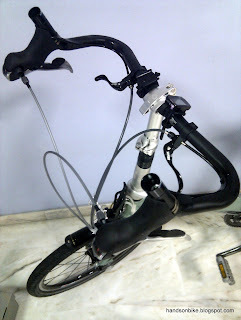 Another major modification is the addition of a front derailleur! 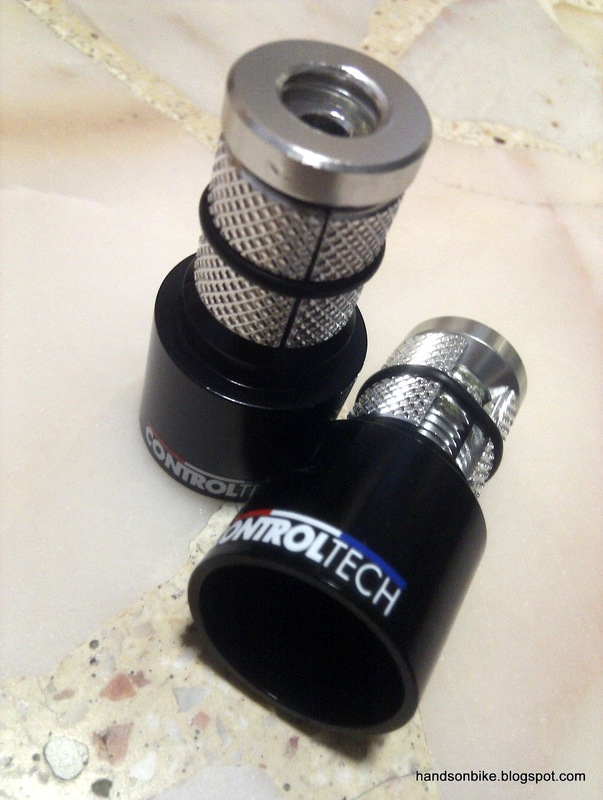 A LitePro FD adaptor is first used to provide a mount for the FD. 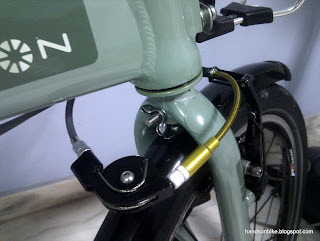 Bar end extensions for the bullhorn. 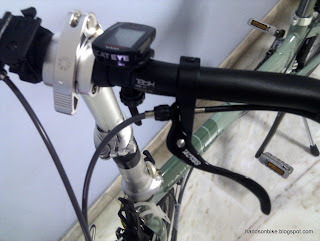 Extends the "horn" by 20mm. Provides a firmer grip when holding the ends of the bullhorn bar! Close up shot. 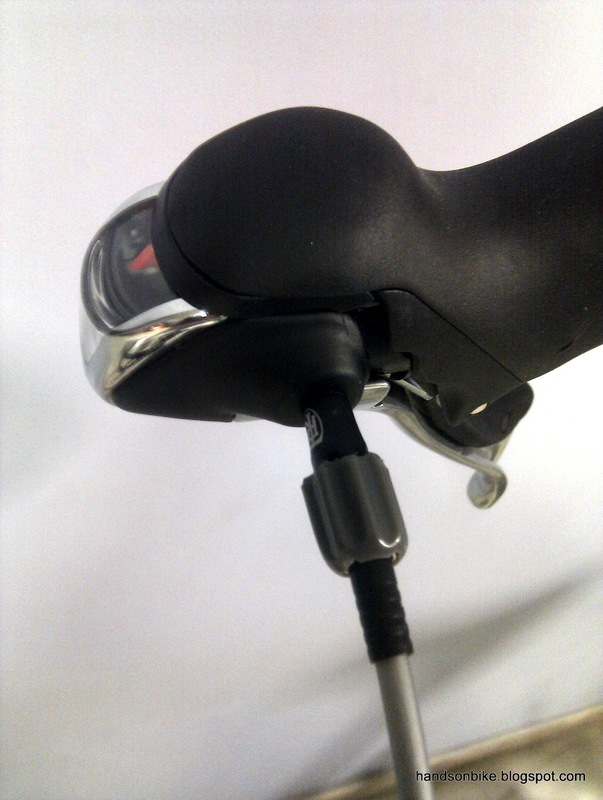 Fits nicely into any handlebar. 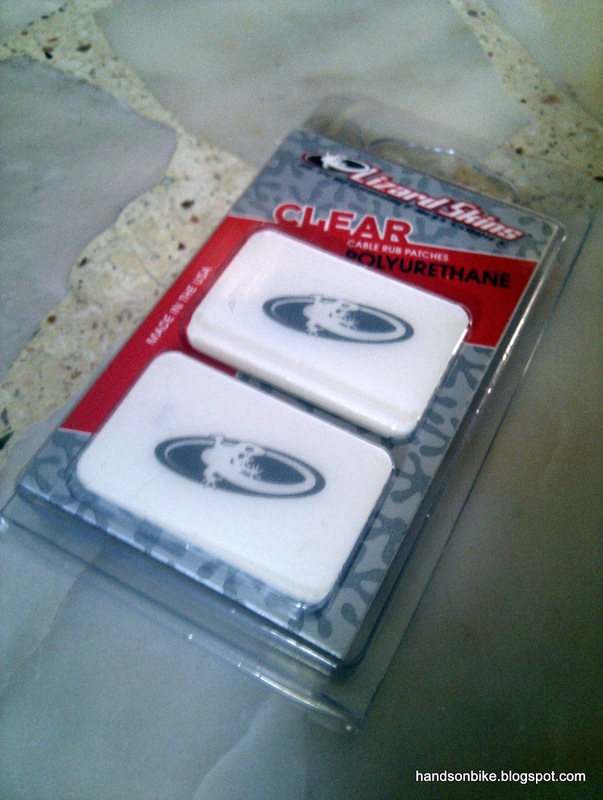 Some clear polyurethane patches to protect the frame from cable rub. Very thin but tough. Inline barrel adjusters for adjusting the cable tension. Not so important for the rear shifter, but essential for the front shifter. Bullhorn bars mounted on the bike, cables all done up. 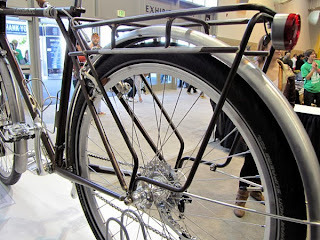 Got to make sure there is enough slack for steering and folding the bike. Innovative front cable routing for the front brakes. Instead of putting the Travel Agent on the brake calipers itself, I used a flexible brake noodle so that I can put the Travel Agent elsewhere. This allows the front brake cable to be routed under the frame and behind the fork, just like the stock front brake cable routing. 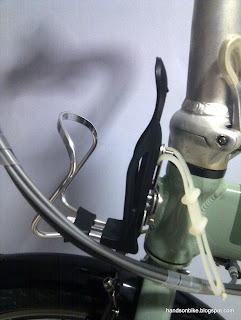 The main reason for this arrangement is so that the handlebar can be steered to the left without the Travel Agent hitting the bottle cage in front! Another reason is to avoid stretching the front cable when folding down the handlebar. Clear patches placed at strategic locations to protect the paint! Rear system all done up! 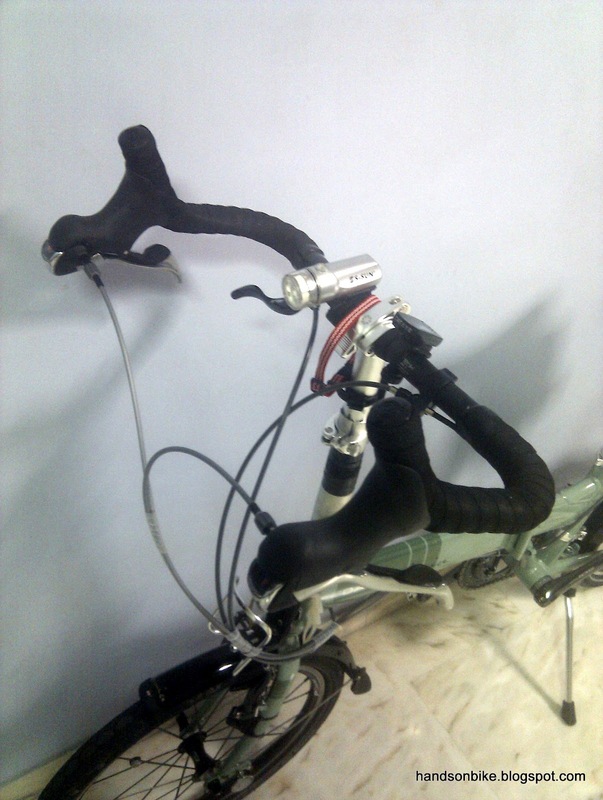 After wrapping the bar tape! 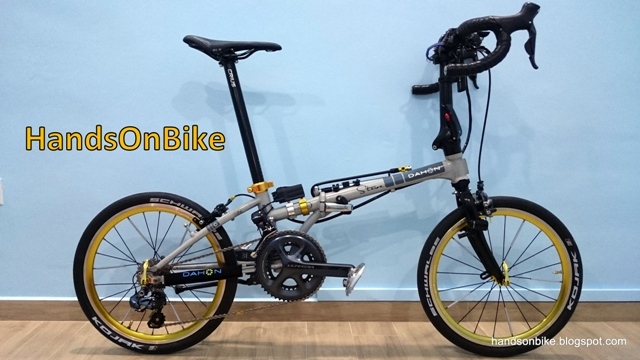 The Vitesse P18-TT is ready to roll! 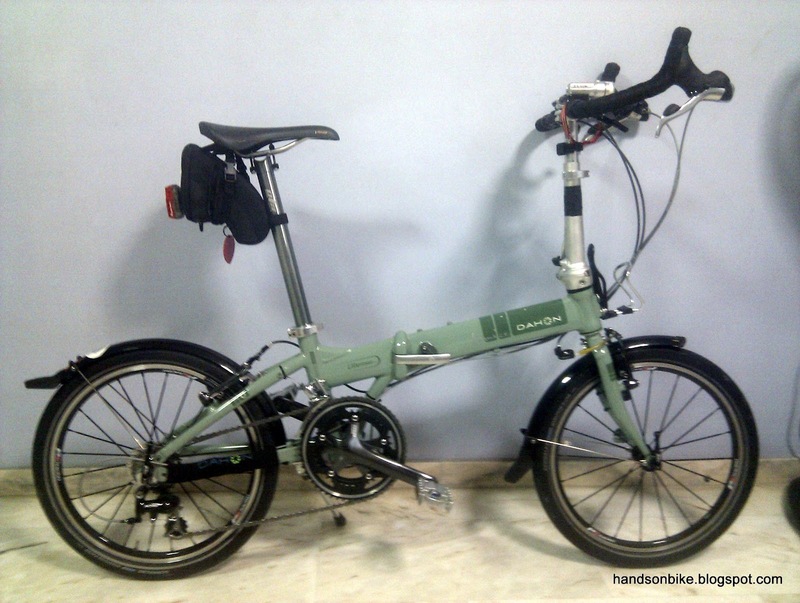 With 18 speeds and a comfortable bullhorn bar, this bike can do more than just leisure rides! It was not an easy upgrade as there were a few issues with the chainline and the cable routing. Luckily I had the experience gained from the previous upgrade to my Boardwalk TT to help me, which enabled me to foresee certain problems and solve them, and improve on certain aspects such as the front brake cable routing. i am thinking of upgrading the stock crankset ... can i check with u whether ultegra 6650 SL cranks with 6700 BB can fit my bike? got to take note of the chainring size. from what I understand, the FD mount on the frame is designed for a 55T front chainring? 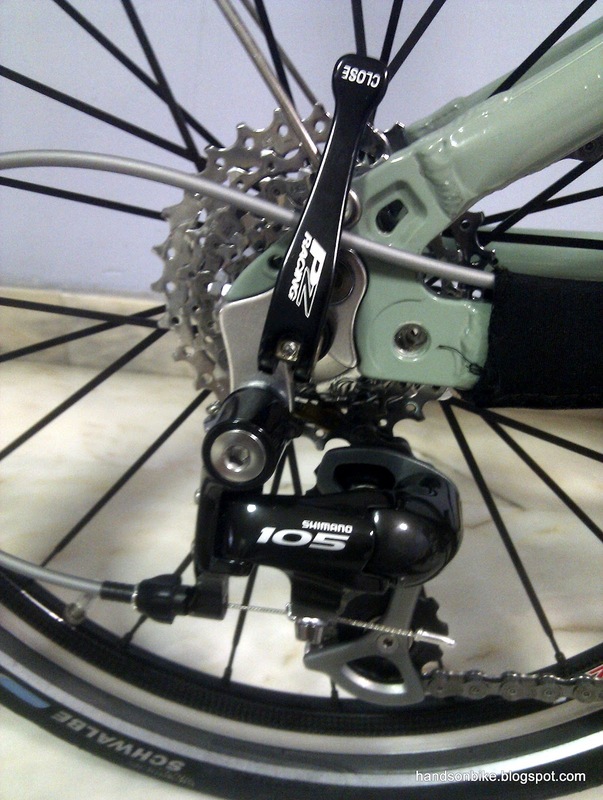 if you change to a compact crankset, with 50T as the max size, the FD may be located too high up to give good front shifting performance. thanks, steve ... if the new chainrings are 53T/39T (stock is 55T/44T), will it be a problem? it should work, although the shifting performance may not be as good or you may experience chain drop. Not too sure what is the distance, but if you use a road Hollowtech crankset and bb, you can put a maximum of about 1.5mm spacer. Anymore and you can't tighten the left crank. Hi Steve, Are you able to post photo on how you route your left shifter cable to your FD. You can find more pictures on this post. 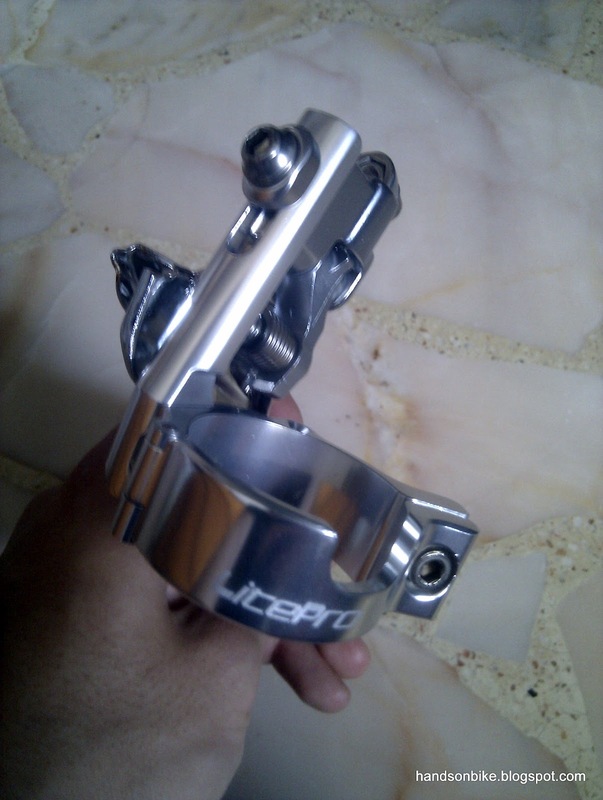 Basically, the front shifter outer casing will exit the shifter and follow the rear outer casing, all the way till the main frame clamp area. 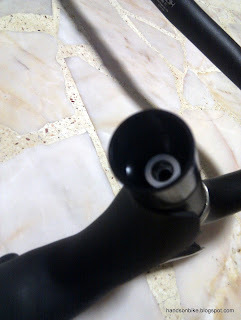 Then, the FD outer casing will run under the BB, and back up along the rear of the seat tube. 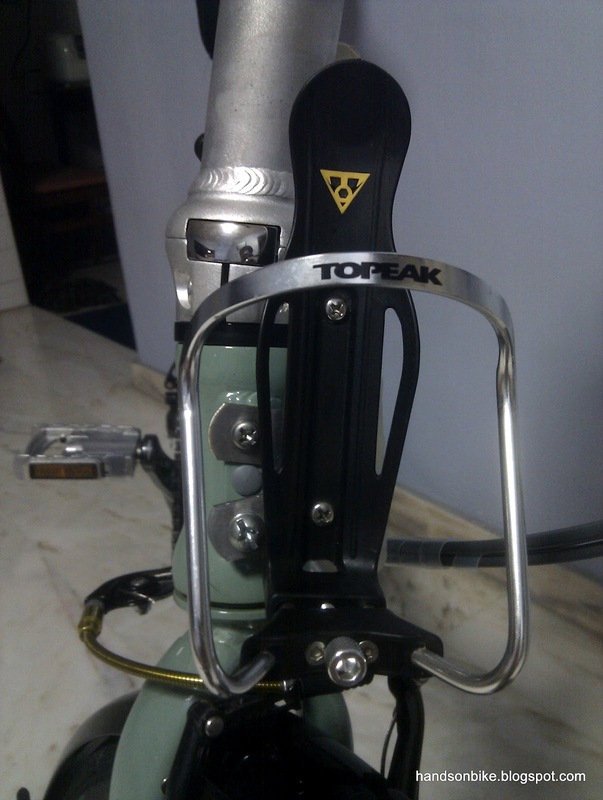 Then, it will go into the cable stopper on the FD adapter clamp. 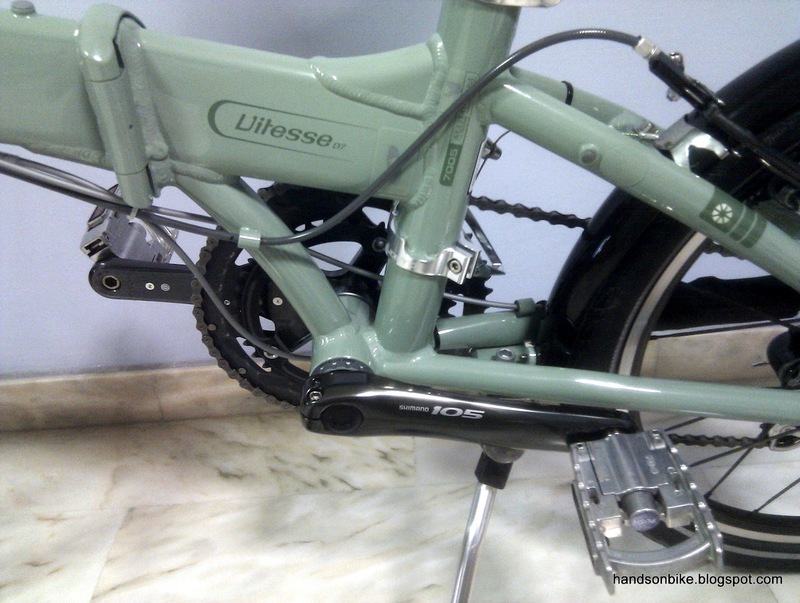 Hi Steve, I just convert my vitesse from a 8 speed to a 10 speed. 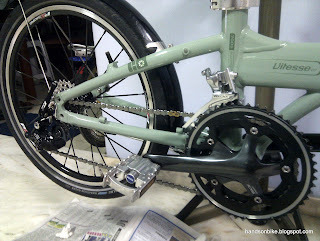 But I encounter a problem which is when I shift the rear to the biggest sprocket my front large chain ring can't hold the chain well and it keep dropping to the smaller chain ring when it comes to a particular teeth on the large chain ring. Any idea what is happening? 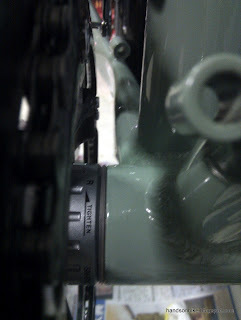 Thats because the double crankset that you have are designed for shifting. 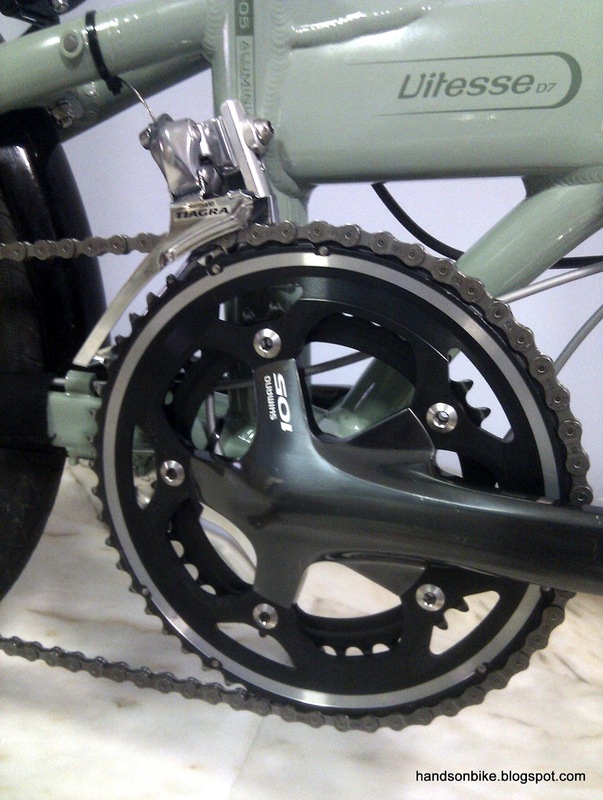 The chainrings are designed to help shifting. If there is no FD to help guide the chain, it will tend to fall off to the smaller chainring when in the larger sprockets at the rear. Are all the components in your drivetrain 10 speed? 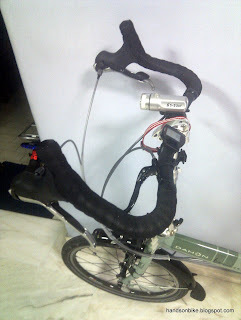 Hi Steve, all my components are 10 speed and at first I did not have such problem but after a few ride and this things happen to me. 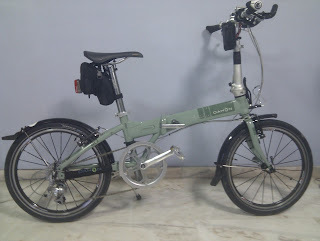 Will prepare for an upgrade soon to make it 20 speed. 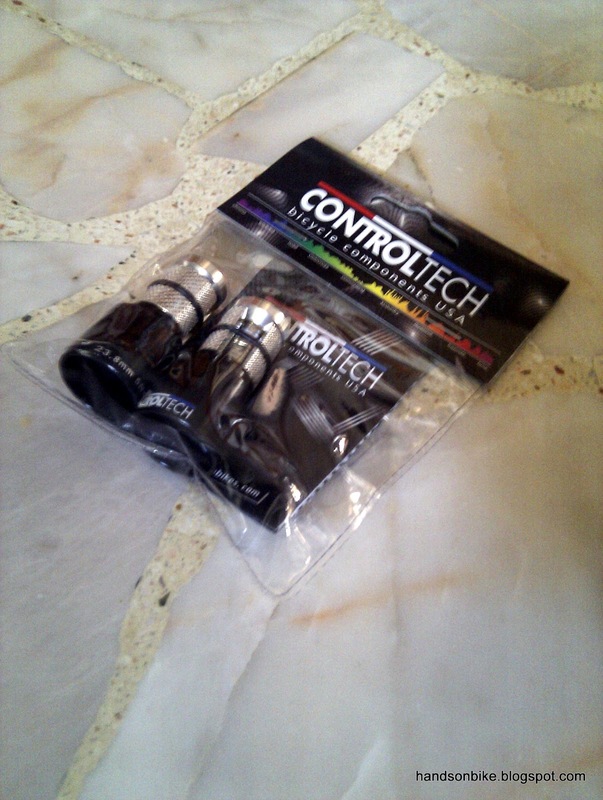 Thanks for you help!